to schedule your next lesson! Learn my golf teaching philosophy and how I can help you improve your game and lower your golf scores. Golf lessons in the chicago area with golf instructor Sarah Pesavento. Get Sarah's latest golf swing video tips and help with improving your golf game. Just wanted to give you an update on the effect of your lessons. I led my flight in scoring and my team won our league championship. I received a lot of feedback saying my game had really improved. Thank you." 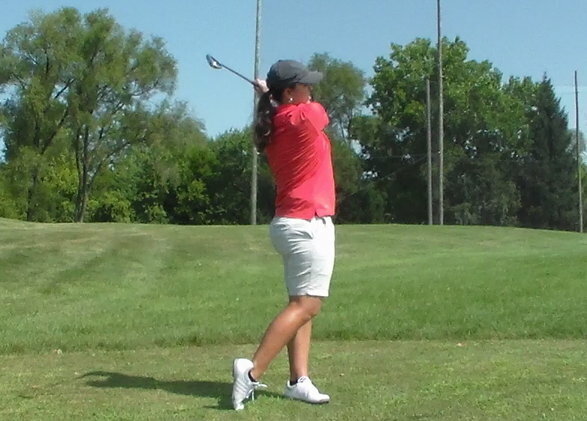 "Sarah is knowledgeable, patient, and willing to work on the parts of the game that you want to work on." - Barbara C.
"Sarah is the best instructor that I have had the pleasure to work with. She keeps her lessons simple and makes them so easy it is almost impossible not to understand and apply the concepts. Thanks to her I have dropped 20 strokes and counting." - Jon G.
Content Copyright 2010-2019. Sarah Pesavento Golf. All Rights Reserved.